*Offers end August 31, 2016. 0.9% APR for qualified buyers through BMW Financial Services. APR covers 3asy Ride up to 48 months and conventional 60 month loans, subject to credit approval. APR is compatible with Factory and Loyalty/Conquest incentives. Loyalty/Conquest incentive available to current or former BMW customers and current non-BMW motorcycle owners. Trade in is not required. Specific financing terms based on credit approval. 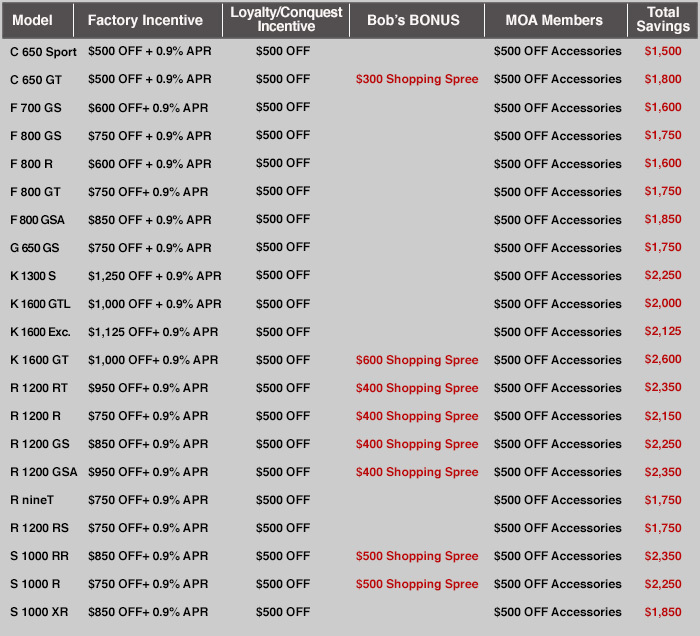 MOA Members must provide original voucher to redeem $500 off accessories-no photocopies, or reproductions will be accepted. Voucher has no cash value. Limit one per customer and purchase. Voucher must be completed in full. Shopping Spree applies to accessories only and is only eligible with specific 2016 models. It CAN be combined with current factory incentives, MOA incentives, and BMW purchase programs (i.e. 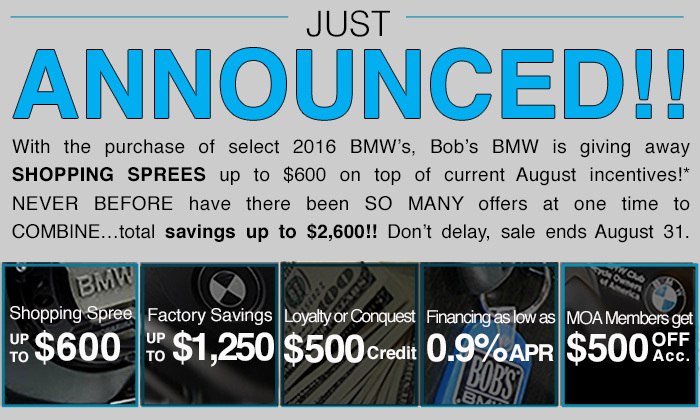 military or emergency personnel); however it cannot be combined with exclusive Bob’s BMW programs (i.e. new rider, MSF coach). Please ask yours sales person for complete eligibility details and required documentation. Some restrictions do apply.